Ananya Dance Theatre and Public Functionary present a two-part convening, in which both organizations will host cross-disciplinary community dialogues with Twin Cities artists and cultural producers to investigate how artists of color participate as unseen members of the avant-garde. We will explore how mainstream structures define understandings of innovation, cultural specificity, community-engaged artistic processes, and what makes work contemporary. These dialogues will serve as follow-up to past conversations hosted separately by Ananya Dance Theatre and Public Functionary, and will be hosted at their respective art and community spaces in Saint Paul and Minneapolis. The convening and conversation events are invitational. 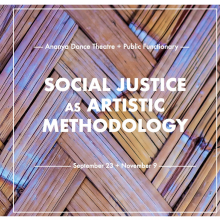 In this conversation, following Ananya Dance Theatre’s premiere of Shaatranga, we will investigate the impact of social justice art-making from the perspective of several disciplines. What kinds of aesthetic decisions emerge when centering social justice within the creative process? What kinds of different designs are produced? How is this different from thinking of social justice as thematic overlay, or as part of outreach connected to audience development? What are the implications of these choices in reorganizing the broader artistic fields? This first of a two-part conversation is hosted by Ananya Dance Theatre in partnership with Public Functionary with local and national partners. We will hear from artists and arts organizers so we can understand the particular creative practices that have emerged from social justice methodologies. The conversation, organized as a circle, will make space for multiple voices and perspectives and a range of experiences with social justice art-making methodologies. Presentations by: Dameun Strange, Chamindika Wanduragala, Marcus Young & Ananya Chatterjea. The second convening hosted by Public Functionary will build on themes and ideas that emerged in September. We will explore how we can conceptualize art as a vehicle for social change in a new, more relevant framework. The format will center around a family style meal, artist presentations and open conversation. What are our pre-conceptions about art-making and arts organizing as a vehicle for social change? How can these assumptions be challenged, experimented with, or pushed in entirely new directions? How do we advance our ability to distinguish different practices and see the range of work happening from artists working within the bounds of tradition, to artists deconstructing traditional practices and creating newly emergent aesthetics? Why does cultural specificity deny indigenous and POC artists the visibility to re-imagine their aesthetics and innovate in their own models? How can we experience/present artistic work on its own terms? How can we support a growing awareness for justice and implement equitable models of curation and participation?